With the recent announcement of the long awaited KINGDOM HEARTS III, along with FINAL FANTASY Versus XIII having now been renamed to FINAL FANTASY XV, we felt that exploring the connection between these games would be prudent, seeing as they have a lot more in common than one might initially think. They are, for one, both being crafted more or less by the same group of people, most noticeably written, designed and directed by Tetsuya Nomura himself. For those not too familiar with him, Nomura is the mastermind behind the KINGDOM HEARTS series, along with being deeply involved with numerous FINAL FANTASY titles, starting as a debugger for its fourth installment back in 1991 and eventually working himself up as the main character designer and writer for the series’ most popular titles. Although the KINGDOM HEARTS series draws in fans for various reasons, one of the larger ones is definitely because of its potency to mix and mesh various genres together. 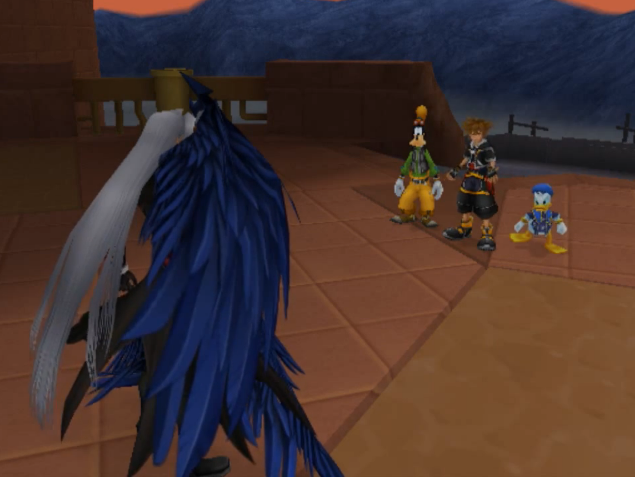 Placing Donald Duck and Sephiroth in the same world, for instance, was considered as odd and strange as video games could possibly get. Yet people quickly embraced the idea of interacting with characters from such Square Enix franchises as FINAL FANTASY and The World Ends With You, and after eleven years, this mix has become familiar and welcome to every fan. However, even though characters from Disney properties remain relatively similar to their movie counterparts, the Square Enix characters are generally different from their respective FINAL FANTASY titles. For example, main characters from the FINAL FANTASY franchise appear as parallel versions of themselves, who happened to grow up in KINGDOM HEARTS worlds like Radiant Garden, instead of their own original worlds in the FINAL FANTASY series. Most of these characters hail from games on which Nomura had the most impact, most notably FINAL FANTASY VII, VIII and X. This leads us to Nomura’s latest project, his first directed FINAL FANTASY game which has been described by many as his magnum opus, FINAL FANTASY XV. FFXV was originally cited as the reason why fans would not see a true HD console iteration of the KINGDOM HEARTS series for a long while, since the team responsible for it is the main development team behind KINGDOM HEARTS, Chain of Memories and KINGDOM HEARTS II. A lot, however, has happened since then and now there’s a new KINGDOM HEARTS development team in town, Production Development Department 5 of Square Enix (PDD5), responsible for Birth by Sleep and Dream Drop Distance, the two huge console-like titles released for the PSP and 3DS. After strong hints about KH3 being the next title in works, and Nomura’s statement that he now considers PDD5, or the “Osaka team” as he likes to put it, as the main KINGDOM HEARTS development team, it was not hard to put one, one, and one together. All that was later confirmed the day after KH3's announcement. Nomura’s long awaited FINAL FANTASY game should therefore share a lot with KH3, the upcoming last installment in the Dark Seeker Saga. Not only will they share a similar gameplay design (hack n’ slash action JRPG), but they will also in all likelihood be released in a relatively similar timeframe. Since FFXV has been in development longer, it will most likely release first. This could very well mean that characters from FFXV may be featured in KH3, in a similar manner to how previous Square Enix characters have appeared in the series before, as mentioned above. 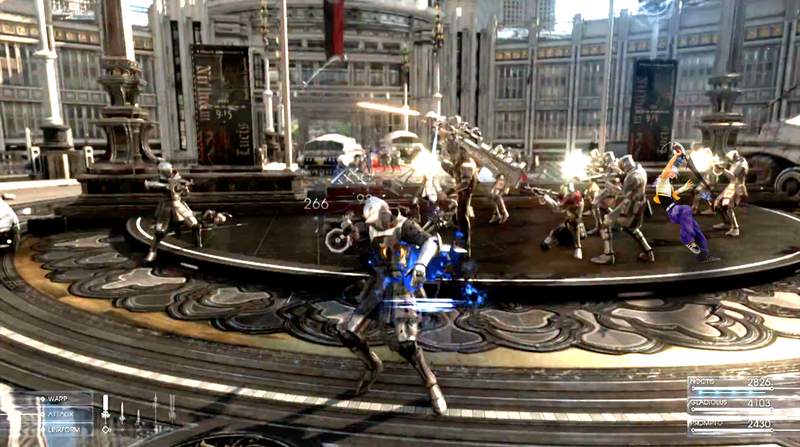 Under normal circumstances, Noctis, the main character of FFXV, would suffice as a cameo appearance in a KINGDOM HEARTS original world, akin to Radiant Garden or Traverse Town, giving words of advice to Sora, Donald and Goofy about all the various feels related to strength of heart, how light triumphs over darkness or how to show patience and be excited for the final clash with Xehanort. FFXV having its special connection to KH3 might however give it a chance to delve into something deeper. At this point, we still haven’t received enough information about FFXV’s’ plot or characters, but based on the special connection between Noctis and Stella, the two most prominent characters in FFXV, there’s a good chance of having the character Stella also appear in one way or another in KH3. At the moment, it is however impossible to tell exactly how their relationship will develop in FFXV. It might however prove very interesting to have both her and Noctis portraying their relationship in KH3, as their otherwise friendly relationship in FFXV becomes rather hostile as the plot develops. According to the scraps of information we have collected over the years, Noctis and Stella share a certain power related to Etro, the goddess of Death. This grants them the ability to summon multiple weapons and fight with superhuman strength. Sometime during the game’s beginning, they will apparently meet and appear friendly towards one another until later in the game, when they’re seen fighting each other. This could project itself over into KH3 with various interesting twists. Either Noctis or Stella might for example side with Master Xehanort’s side of darkness, while the other fights with the protectors of the light. Since we do not truly know which character fights for the better cause in FFXV, we wouldn’t know for sure whether Noctis would necessarily side with Sora or Xehanort in their final clash. For instance, Noctis’ arrogance in the 2011 trailer is apparent when he overestimates his power and places too much emphasis on it, ignoring his friends’ advice. This arrogant move of his calls to mind Riku back in KINGDOM HEARTS when he himself fell to darkness. Since we haven’t been able to play FFXV yet, it’s hard to tell what sort of character development Noctis will receive and how that would appear in KH3, so I would advise every reader to take the above statements with a grain of salt. Nevertheless, having a potential character development for Noctis where he would learn from Riku’s mistakes and turn to the light, would certainly be appreciated by many fans of Riku. FFXV’s inclusion in KH3 could just as well be minimal. This may range anywhere from having the characters featured in a battle arena, akin to the Olympus Coliseum, where in order to win a special cup, you would have to subdue the cast of FFXV in an epic battle. A character, entity or basically anything at all could also present itself in KH3 as a secret boss fight, similar to what Sephiroth, Xemnas or Vanitas for instance did in previous entries in the series. Then again, it could be just as nominal as having a younger Noctis make a cameo appearance in some world, similar to Tidus, Wakka and other FINAL FANTASY cast members. 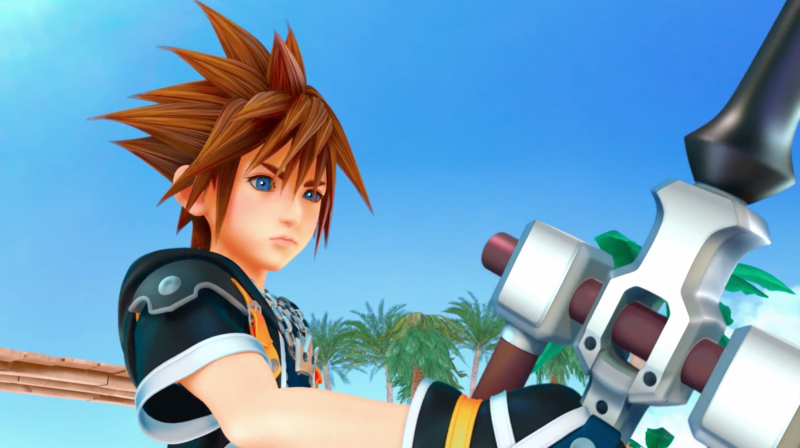 Destiny Islands and Twilight Town served a certain role as a non-Disney world in their respective games, so if KH3 were to introduce a new world such as those, a young Noctis might just be spotted roaming around, perhaps even as a spoiled little prince befriending Sora or some other main character. Since both of these titles have so much in common, especially because FFXV is described as a realistic derivation of the KINGDOM HEARTS series, we shouldn’t rule out the possibility of KINGDOM HEARTS cameos in FFXV. They would most likely be much lower profile than the cameos in the KINGDOM HEARTS series. If it were to happen, it would probably be, for example, in the form of graffiti on a city wall, or perhaps even something as atypical as a tombstone for a KINGDOM HEARTS character, similar to how in the original FINAL FANTASY game, one could stumble upon an easter egg in the form of a tombstone where “Here lies Link” is written, referring to the main protagonist in the Legend of Zelda series. Tying in FFXV and KH3 would ultimately be quite beneficial, and undoubtedly a very smart move on behalf of Square Enix, since it serves to utilize the already existing hype for both titles, along with promoting the later release of KH3. Whatever the outcome will be is of course open to speculation, and I’d love to hear your ideas on it. Which characters from FFXV would you like to see make an appearance in KH3? Do you think it might have a special effect on the game’s plot in any considerable way? What about having KINGDOM HEARTS referenced in FFXV in any way? 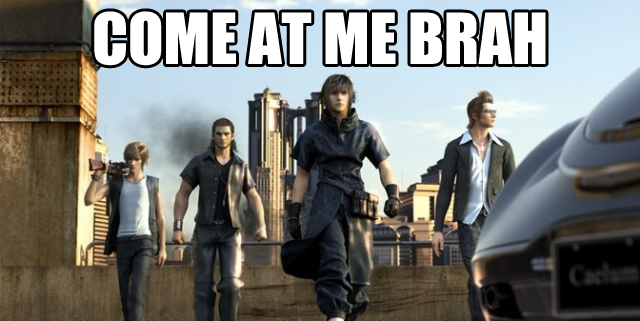 Or do you feel that KH3 and FFXV should stay away from each other altogether? Comment away! Your signature works in humorous fashion with this editorial, I must say. Love your editorial. I'd DIE if they included kid!Noctis as a character in some new original world, who is a little brat and brags about his awesome fighting skills as a kid, who will also teach Sora a skill or you have to help kid!Noctis find his way hope in Winnie the Pooh fashion rofl. I'd like more non Nomura designed Final Fantasy character. "Which characters from FFXV would you like to see make an appearance in KH3? Do you think it might have a special effect on the game’s plot in any considerable way? What about having KINGDOM HEARTS referenced in FFXV in any way? Or do you feel that KH3 and FFXV should stay away from each other altogether?" In FFXV maybe they could have a keyblade as a secret weapon. But id love if Noctis was in KH3. I suppose it would depend on the gap between the two games' release dates, but I'd personally prefer any Easter Eggs in FFXV/Cameos in KH3 to be very minimal. This is less for the sake of KH3 and more for that of FFXV. I want to give the game's story and characters a chance to breathe, letting their personalities get absorbed into the collective JRPG-loving subconscious before being turned into KH cameos. I mean, I enjoy the cameos as much as anyone else, but they don't exactly shy away from liberties. 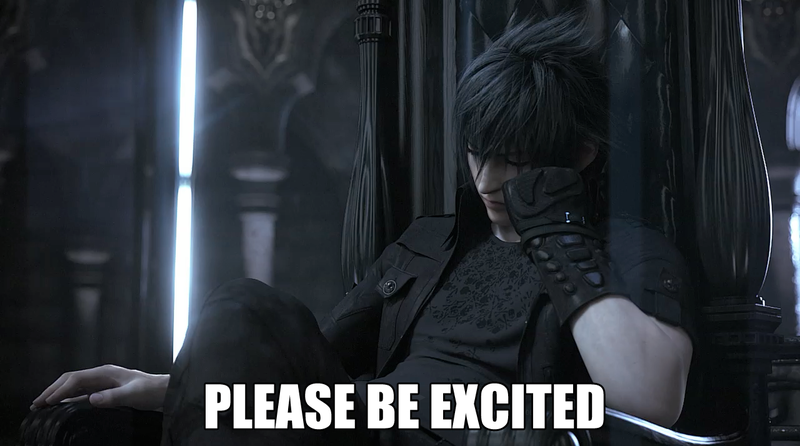 If the FFXV releases well before KH3, then I'm less concerned. Otherwise, I don't want Noctis' actual character running alongside discussions over the keyblade and darkness with Sora. A noctis/stella arc in KH3. Might not quite do it justice. Though I'd love to see young Noctis! I'm all for FFXV cameos in KH3. The woman fourth from the right in Gexus signature reminds me a lot of Lulu from FFX facially, and considering that Lulu and Kimahri are the only two main characters from FFX not to feature in KH yet, I'd like to see Lulu and this other female from FFXV appear together to celebrate FFXV and the FFX HD Remaster. And given that there are ties back to Etro and the world of FFXIII, I'm always keen for more Lightning and would love to see her interacting with Sora and Noctis. I wouldn't want FFXV to impact too much on the plot of KH3. I'd like it to feature about as significantly as the Cloud/Sephiroth storyline in KH2 with a potential, semi-difficult boss battle with a FFXV character. I 100% agree with this sentiment. Besides, there are a 15+ other Final Fantasy games to mine cameos from. The feeling I get from FF's involvement in KH (and this is purely personal) is that it's supposed to work the same way Disney does; it's like revisiting an old friend you didn't even realize you missed having around and seeing them in a somewhat (perhaps very) different light. It's all about nostalgia, and I just don't think an FFXV Noctis or Stella appearance would come across as so much of an exciting novelty if the games are released in near proximity. On the other hand, if they give it a few years and depending on the traction the FFXV cast gains in popularity, it could be a very interesting prospect, particularly if you get to fight any of them. KH and FFXV are supposed to share some similarities in gameplay (I think?) so Noctis et al may come equipped with an arsenal of moves and combat behaviors that would flow just fine in the KH-verse. It could be the most seamless transition for any FF character(s) thus far. That is true. We don't want to see KH3 bogged down with additional plot points besides what already needs to be worked on. This is why it'd be nice to just see Noctis as a kid because that way he won't be a dominating factor in the game if he does make an appearance. Please, again this is not a discussion about what FF characters should appear. This is purely about how XV and KH3 can impact each other, be it through cameos, indirect or direct references, why XV shouldn't make an appearance in KH3, etc. There is a discussion for that already. Maybe Noctis could see Kingdom Hearts, the world, in the sky and say something like "How interesting". Noctis will totally get a ring that's shaped like Sora's crown icon. I wouldn't be surprised if they put in the Keyblade as a weapon as a joke, similarly how you could play with Altair's robes in Metal Gear Solid 4. Most of the characters in KH, FF and Disney, are characters that have been around for at least a few years before the KH game they were in came out (FFX characters were an exception). XV may well have not even come out before KH3, so what we saw of Noctis would give us a preconception of what he'd be like in XV which would probably be wrong. If they need a lost little boy from the FF universe they might as well use Hope anyway, spends about 80% of XIII acting like one! Personally I find it most likely that Noctis will appear in his younger form in a cameo, perhaps similar to Tidus and co.
FFXV is definitely further ahead in development than KH3, that much is certain. Besides, KH3 started development sometime after the completion of KH3D, so I wouldn't expect it for a while. 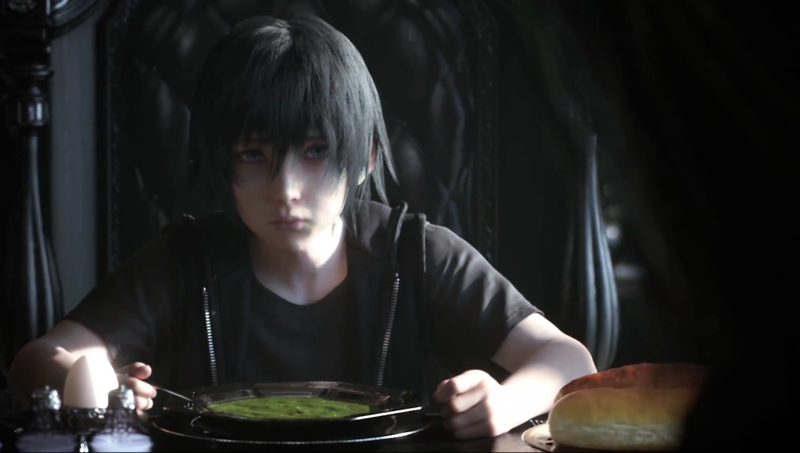 Regarding Hope, seeing as Kid Noctis is already a lot more adored now than Hope, based on one small scene in a trailer, I don't think they would prioritize Hope over Kid Noctis. I very much would like to see not only small cameos, but some canon story involvement from XV. It would be too much of a good opportunity to pass up when you think about how much both games have in common. Something along the lines of the Cloud/Sephiroth story elements from KH I and II would be great, and hell, if they did it smartly, I could imagine giving Noctis a keyblade in KH III, I think there needs to be a few more keyblade wielders anyway. To me, Noctis just seems like he fits far too well as a character in the KH world to not be in KH III. I feel that despite whether there are cameos or not. Not is hardly of importance, what truley needs to be discussed is the intertwining off both the stories from each game and how deep they go I'm preety sure they will correalate with each other in some unfathomable way, before FFxv was what it was it was classified as FFversus 13 as in "organization13, I believe it may be the origin of 13 before the dimensional collapse in kingdom hearts and thus an explaination of their start before kingdom hearts which btw has a very Dee theology and philosophy too it in case you have not noticed. Hit me back if you would like to know how deep the rabbit hole truley goes. Whoo you lost me at Organization XIII. No thanks I am so Ova this theory. Faze it from my mind. Great editorial, I wouldn't mind seeing Noctis play a semi-medium role in kh3 somehow so long as it's not like how they handled Sephiroth and Cloud in kh2.